There’s no sweeter room to style than a nursery. Little Oliver’s nursery is a testament to that, brimming with suave little boy style! 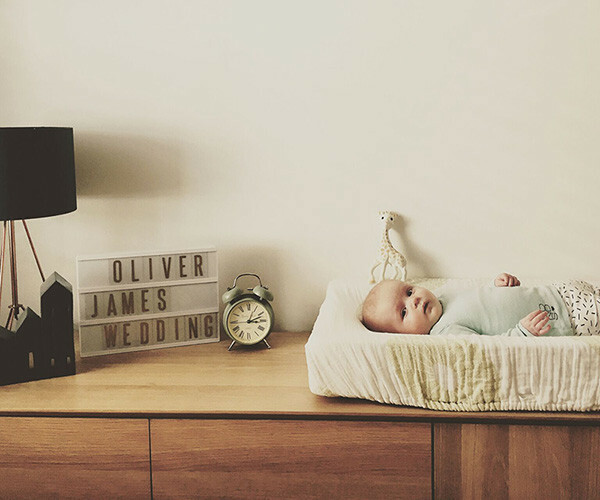 The planning for Oliver’s stunning nursery began when mum Meg reached the halfway point of her pregnancy. 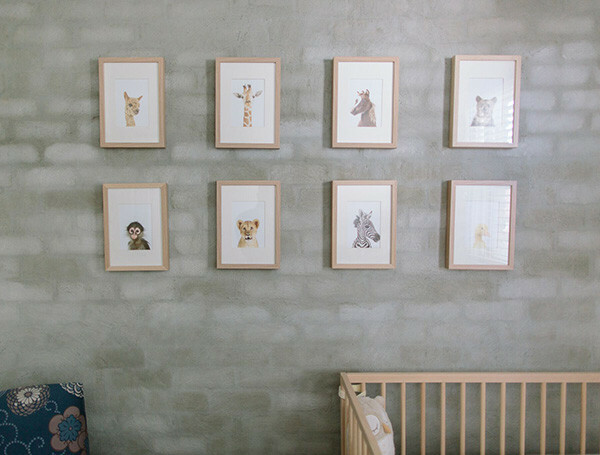 Keeping the baby’s gender a surprise meant that a neutral nursery was in order and though it sounds easy, neutral can be one of the hardest looks to achieve. 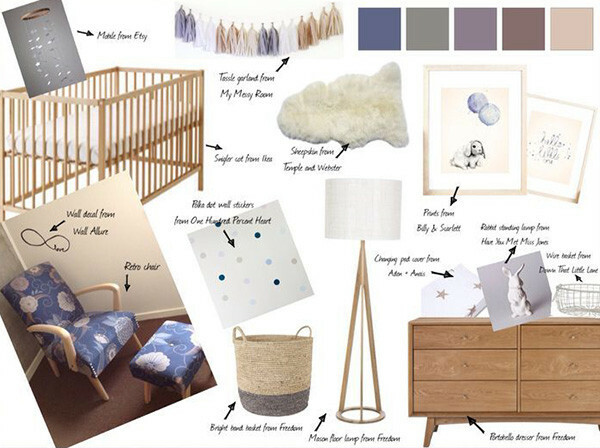 Meg created a beautiful design mood board (pictured below) of how she envisioned their sweet baby’s space, incorporating existing furniture and treasured pieces they already had in their home. A vintage chair which Meg had restored in her twenties inspired the cool colour palette and set the tone for blue and grey hues offset by light coloured timber. You can see a glimpse of Meg’s chair in her mood board. 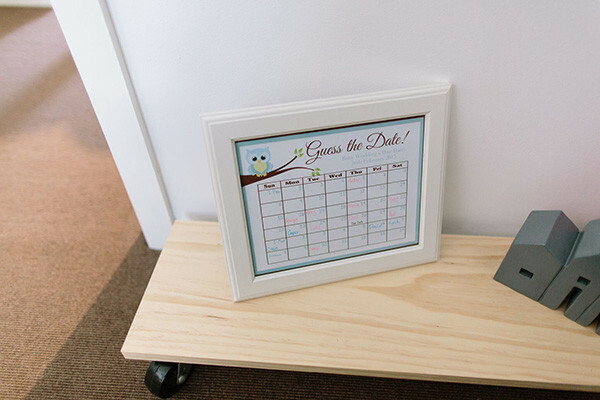 We’re impressed by her cleverness – it looks amazing with its large print and retro frame. From start to finish, creating Oliver’s nursery took around two months, though Meg says she still tinkers with it now, adding new things when she sees them. Details dot the surfaces of this room, like a gorgeous lamp with a copper look base, coordinating houses and a charming vintage style, sage coloured alarm clock. 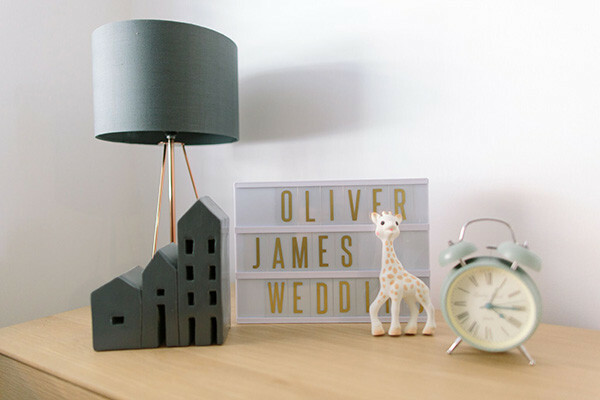 A light box adds an element of fun where classic meets contemporary. Stunning! Meg, we think you’ve done a marvellous job of creating a divine space. Oliver’s nursery is as handsome as his sweet cherubic face and a wonderful base to build on as he gets older. Want to share your child’s nursery with us? Then just fill in the Show us your nursery form on our contacts page. While we can’t reply to every email, we’ll certainly let you know if your nursery is chosen to be showcased on Babyology. We can’t wait to hear from you and look forward to seeing your nursery!